Keep all your jewelry well organized, easy to find, and beautifully displayed when you store them in this black jewelry box. With versatile sections, the jewelry box suits for rings, earrings, necklaces, bracelets, watches and other matching items. Selected materials and fine workmanship create a fashionable look adding décor to your home. Say goodbye to the days of hunting down jewelry you needed, and find what you need instantly. ElEGANT CRAFTSMANSHIP: Made of high quality bright embossed black PU leather coverand soft beige velvet lining.Smooth design is the perfect combination of modern and class. Elegant in appearance and sturdy in quality. 2 LAYERS & 28 COMPARTMENTS: The 1st layer is idal for ring, earrings, necklaces, charms. The second layer of 12 big compartments is ideal for bracelets. It will keep your jewelry well organized and easy to find. Soft lining and will protect your jewelry and accessories from dust and scratches. EASY TO OPEN: Lock with a key removable mini travel jewelry box that adds security to the jewelry box. Removable design provides more space.Earrings, rings, brackets, necklaces can be held. 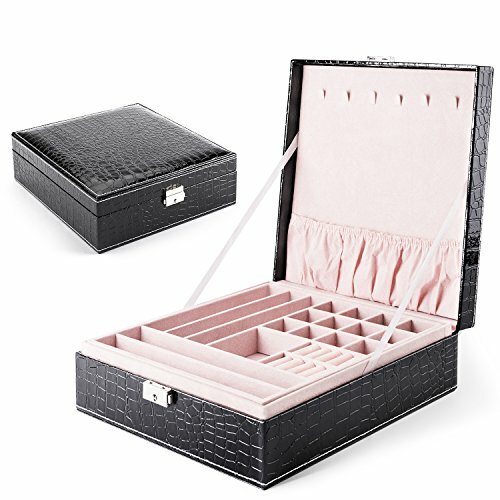 PERFECT GIFT FOR GIRLS: This compact jewelry case will help you to keep your jewelry and small things in good order with its divided slots. It is a ideal gift for daughter, girlfriend,besties on birthday,Valentine Day,Thanksgiving Day,Christmas,etc. 100% SATISFACTION MONEY-BACK GUARANTEE: If you are unhappy with your jewelry box, simply return it within 30 days for a full, no questions asked refund. Feel free to contact us with any questions or concerns! If you have any questions about this product by MESHA, contact us by completing and submitting the form below. If you are looking for a specif part number, please include it with your message.